The Zambian government on Wednesday said it aims to eradicate malaria within three years after deaths from the disease halved last year from 2014. In Zambia, malaria is the biggest cause of attendance at health facilities, and every family in the Southern African nation has lost someone to disease. However, the country had recorded a decline in malaria incidence rates from 407 cases per 1,000 in 2014 to 336 cases per 1,000 last year and would be malaria-free by 2021, nine years earlier than the African Union target. 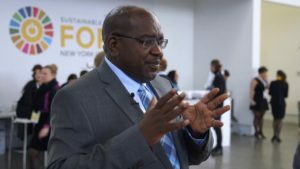 According to Health Minister Chitalu Chlufya, the disease counters progress in development but it is a preventable and treatable disease. Earlier this year, President Edgar Chagwa Lungu said his country has already achieved near elimination in two of Zambia’s 10 provinces. Across the country, the deaths have been reduced by 70 per cent in the past five years, he said. Health authorities have deployed interventions that span mosquito control, case finding and treatment, and enhanced surveillance, Lungu said. The Global Fund and the US President’s Malaria Initiative had dedicated $8.5m to malaria programs in the country. Posted by Khalid Al Mouahidi on June 28, 2018. Filed under Zoom. You can follow any responses to this entry through the RSS 2.0. Both comments and pings are currently closed.